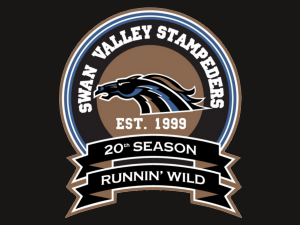 The Swan Valley Stampeders continue to instill the word believe in so many fans. Tonight’s 4-3 triple overtime win over the Portage Terriers proved that believing leads to great things. Kasyn Kruse would open the scoring tonight, beating Terriers netminder Ethan Peterson in tight, potting his seventh of the playoffs at 11:20 of the opening period. The Terriers would tie the game at 1-1 before the period ended when Ty Barnstable was sent in all alone, beating Stamps goalie Merek Pipes with 31 seconds left in the opening frame. Portage would take the lead 7:36 into the middle frame as Chase Brakel beat Pipes, collecting his sixth of the post season. Not to be undone, Matt Osadick would tie the game at 2-2, 11 minutes later beating Peterson on the blocker side. After forty minutes of play the score was knotted at two and the shots were 24-22 in favour of the host Terriers. Portage would once again retake the lead when Jay Buchholz buried a loose puck 1:44 into the third period. With time winding down, captain Brian Harris would tie the game up at 3-3, deflecting home a Bradly Goethals shot at the 16:12 mark sending the two teams to overtime. Shots on goal after 60 minutes of play was 35-30 for Portage. For the second time in the Turnbull Cup Series, the MJHL’s top two teams found themselves needing extra time. Merek Pipes was the story of the first overtime period, turning aside all six shots he faced through the opening, ten minute overtime period. After 70 minutes of play the teams headed to be dressing room with the shots 41-31 in favour of Portage. The two teams continued to fight for every inch of ice during the second overtime period but were unable to solve Pipes or Peterson. After 90 minutes of play the teams headed to the dressing room for some much needed rest. Bradly Goethals would play the role of hero, snapping home his 11th of the playoffs 1:46 into triple overtime, beating Peterson 5-hole and giving the Stampeders a 3-2 series lead. After giving up 3 goals during 60 minutes of play, Merek Pipes was on complete lockdown for the rest of the game, backstopping his team to a 44 save win in net. Final shots on goal was 47-41 in favour of the host Terriers. With tonight’s win, the Stampeders now lead the Turnbull Cup Series for the first time, and will have a chance to win the Championship on home ice this Thursday night. Puck drop is scheduled for 7:30 pm. Tickets are available at Atkinson’s Sports Excellence or at the door. Reminder that it is rush seating.